Out of all the cosmetic dental treatments currently available, teeth whitening is consistently one of the most requested at dentist offices in America. In fact, a survey by the American Association of Orthodontists found that almost 90 percent of patients ask for this treatment. This is because professional tooth whitening is a very quick way to make your smile look remarkably better—just in time for important social and professional engagements. Learn more about what this popular cosmetic treatment entails. Our teeth are naturally the color of a white eggshell, but as time goes on that color changes due to eating and drinking foods that stain the enamel. Patients who are regular smokers also often develop stains on the teeth due to the tar in cigarettes. 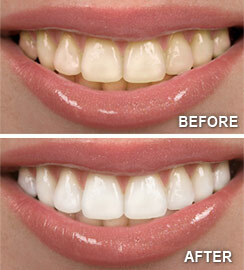 In-office teeth whitening by a dentist is usually the only reliable way to get rid of stubborn stains. Having a white smile is important to people because it makes them look younger and healthier. There are two main options for having your teeth professionally whitened. Your dentist can provide you with a take-home tray that you’ll wear over the course of a few weeks. But the best option, if you want to see a significant smile improvement, is to just have your dentist whiten your teeth in the office. The process takes about 60-90 minutes and leaves your teeth looking up to four shades whiter. Brush and floss regularly, especially after drinking or eating something that’s dark in color. Work with a specialist to quit smoking if you want to keep your teeth white. Interested in brightening your smile with Teeth Whitening? Call Asuncion Dental Group in Frederick, MD today at (301) 620-8882 to schedule an appointment!